I shoot Fuji X series, shoot Raw (and Jpeg) and normally edit the Raws in CS6. I have become aware that if I open the jpeg in CS6 and then simply save it with a different file name the colors are dramatically muted from the original. If I compare the two in a color managed application they are like chalk and cheese. I hadn't noticed this with the Raws as I assumed the flat appearance was because they were in fact Raws and just needed my tender touch! I'm probably missing something really obvious - but it's driving me nuts! When you open the jpegs up in CS6, they look vibrant, correct? Then you save it with a new file name and re-open it, they are muted in colours? That indeed is very strange. just to see if I can replicate that which I highly doubt. Adobe RGB (1998) is a wide gamut colour space used for high end glossy magazines, etc., and regardless of your Working Spaces choice, 99% of the time when you take an image to a lab, it's always converted to sRGB for photographic print even though it's embedded as Adobe. 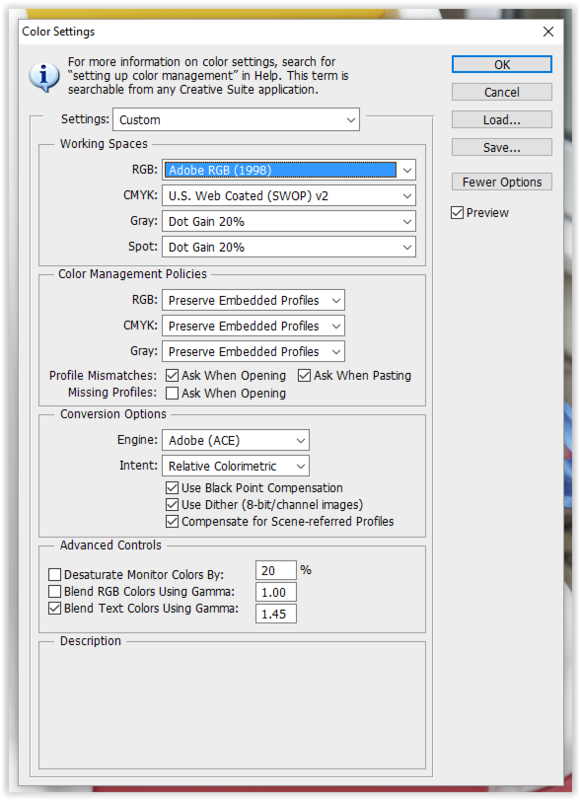 If you don't have any Working Spaces colour setup and the file has no profile embedded, it will automatically embed that sRGB profile in the file before printing. I have my space set up to sRGB because when printing in that smaller colour space and I've edited on my screen, I know that it will print like that as sometimes in small cases you may have very vibrant fluro-like reds/greens, and they may look fine on screen in Adobe, but when print comes back they could very well be flat/dull even. 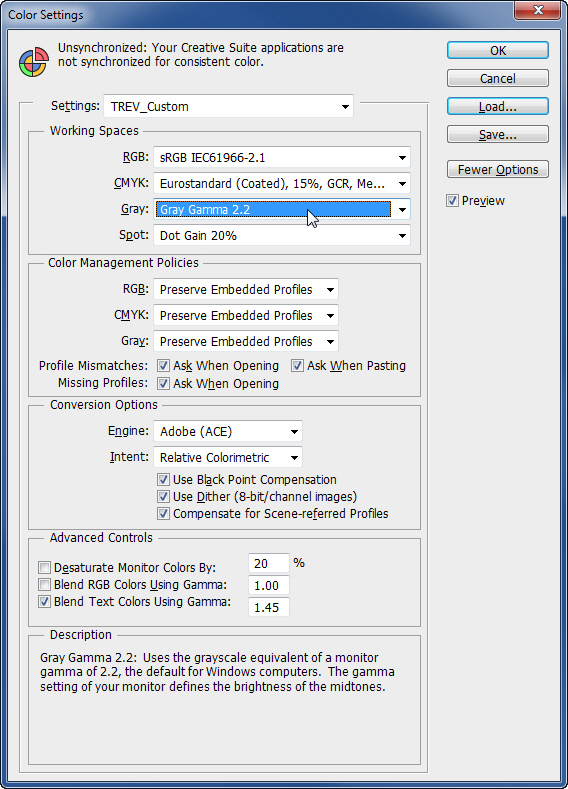 This could be the problem: I noticed in your Working Spaces, in the "Gray" you should have 'Gray Gamma 2.2' chosen, not Dot Gain 20%, I think that could be the trouble, test and see. I am not saying this is the case in your scenario, but I would like a jpeg, not saved, the one straight out of camera if possible to see what I get. I will test on each Working Space, see what happens or indeed if it happens. Thanks Trev - email sent. Got it, and no, that Dot Gain 20% makes no difference, probably only related to Grayscale, dunno, I've never played with it. Just sent you back an email, see what happens with the test I did. I know others in here would like to see that file, but it's a personal one so can appreciate not sharing. Thanks Trev. Perusing in great detail - and with great thanks too! It's likely due to the Adobe RGB working space selection. The original JPG is probably in sRGB, and then when you save it, it is getting converted to Adobe RGB. I would recommend switching it to sRGB and trying that. Yep, I thought that also NikonGuy, and suggested it to him (we have been conversing with emails to be easier and if a solution is found will post) but no luck. "I open an aRGB jpeg with Photoshop set to an aRGB working space and the image looks exactly as it should look with deeply saturated colours - as you would expect. And if I save it – no problem either. But – when I open the sRGB jpeg with Photoshop also set to an sRGB working space the image looks exactly the same as a basic Raw conversion does with muted colours. Not at all what you would expect. Of course if I resave it the muted version is then saved. It appears that for some reason when I open an sRGB file in Photoshop, even with Photoshop set to that working space, the in-camera jpeg conversion is simply being ignored by Photoshop. I know the image file has the data because I can view it in other applications and see the saturated colours - identical to the aRGB file. I don’t think it’s anything to do with profiling, monitor colours or anything like that – just the way the file is read if it is sRGB." If you have any other ideas, pass them on, as it's just strange. Because even if you have a file with Adobe RGB and working space is sRGB or vice versa and you get a warning come up you should be able use embedded profile or change to working profile with no loss of colour. I have seen the side by side samples and it's really desaturated and I cannot duplicate the problem even using my old CS6 and using precisely the same 2 files he used, straight out of camera, and the saved jpeg he did (which looks muted to him), but on my system both identical in all forms. I also changed my profiles to aRGB, ignored the warning and used the sRGB and nothing changed and vice-versa. As I said to him in an email, it's probably something so stupid and simple that just eludes us for the time being. Hopefully in next few days one of us can call the other, go over things in detail step by step, same file on his sytem, as on mine, and swap out settings. It's not as if it has been happening all along, their problems suddenly begin out of nowhere, with no settings/changes made.